UDM Downloads > LastBit Skype Password Recovery! 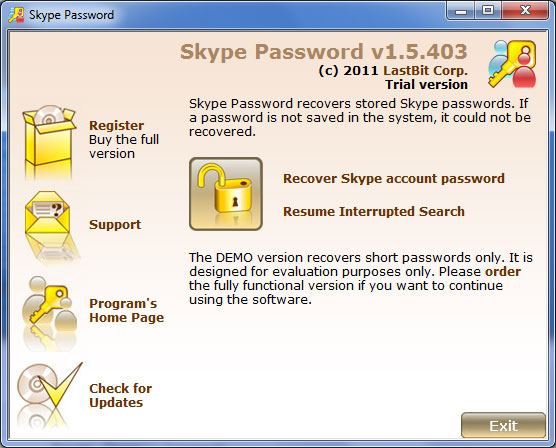 Skype Password is a password recovery tool (although not a password cracker) that is used to recover lost or forgotten passwords for your Skype accounts. It is important that the password you are trying to recover is stored on your computer (i.e. you are recovering your own password and not trying to crack someone's passwords). For all users that are present on the computer the program is launched at, nickname and password will be retrieved. The program is very simple to use, just launch it, make a few mouse clicks and you will get all information about your Skype accounts including passwords. You are not required to be a password recovery professional and make it through a lengthy configuration process - Skype Password works in a fully automatic mode. Even better, you don't have to wait for hours for the password recovery process to complete. Skype does not save the password itself, it saves a password's hash code. Skype Password instantly obtains hash code, but it may take a lot of time to find the password. To recover the password, you have to use the universal password recovery methods, such as Brute Force Attack and Dictionary Attack. Skype Password is very fast, the search speed is about 20,000,000 password per second on a modern quad-core CPU, however if the password is very long and complex, it may take a lot of time to find the password. Note: this program is not a hacker tool. It won't help you to find password of an arbitrary Skype user. Remember that only your own passwords (stored on your computer) can be recovered.